Armed with a megawatt smile and a pocket full of dreams, Erin Jackson is poised to conquer the world of stand-up. In fact, she’d probably be well on her way to superstardom by now if her friends and family hadn’t spent so many years stealing her joy. Since first making a name for herself at colleges and east coast comedy clubs, Erin has garnered national attention with performances on The Ellen DeGeneres Show and Comedy Central’s Live at Gotham. She was a semifinalist on NBC’s Last Comic Standing, and was a featured writer and performer for TBS's Bitcom Series. 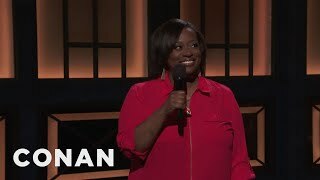 Erin has made several appearances on The Bob and Tom Show, she was invited by HBO to open for Bill Maher at the tapings for his latest HBO special, and recently served as the warm-up comedian for BET’s Black Girls Rock! Awards show. She has appeared on Byron Allen's Comedy.TV and can currently be seen starring in her very own IFC Comedy Moment Moment. If you haven't had the chance to catch Erin live or if you're already a fan, click on over to the calendar page for a list of upcoming shows and check her out when she's in your 'hood.